This page describes settings and forms available in simple, 2D versions of Little Sailor. Note: available features, settings, and GUIs differ on various platforms supported by Little Sailor. 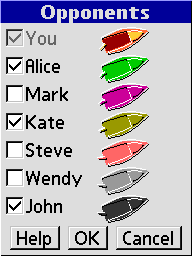 Select sailors that you want to join the next race. Alice (green). Her sailing adventures just begin. Mark (violet). He sailed a boat a few times during his recent holiday. Kate (olive). She completed a basic sailing course this year. Steve (pink). A bit nervous guy who owns four boats. Wendy (light gray). She goes sailing every summer with her family. John (dark gray). Spends free time on his yacht. 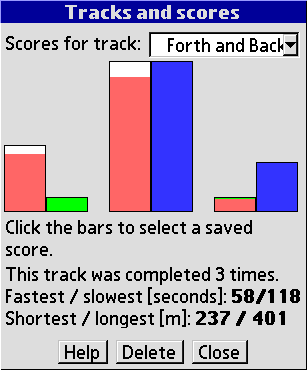 Select a track from the drop–down list and you will see your scores for this track (from left to right, your oldest to your most recent run). There are two bars for each run. 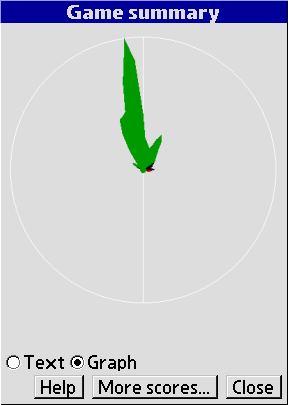 The left one (white) represents run time, the right one (blue) represents run distance. If you see a pink bar on the white bar, this reflects motor usage. The lower the bars, the better. Shortest time and distance are shown in green. Click the bars to select a score and see more details. Press the 'Delete' button to delete the selected score. When no score is selected and a generated track has been chosen, the 'Delete' button can be used to delete the track. This window shows a summary of your recent run. The 'Graph' summary shows the amount of time you sailed in all directions relative to the suggested direction (which is 'up'). Click the 'More scores...' button to go to the 'Tracks and scores' window. Your recent run will be shown as the last one (on the right). See below for the list of settings, available choices and their descriptions. Default values are emphasized. Selects a track. The value in parentheses is the number of gates on a track. You can also create new tracks – select the last item and click 'Go', or see menu:Game/Add random track. Laps to go in the race. 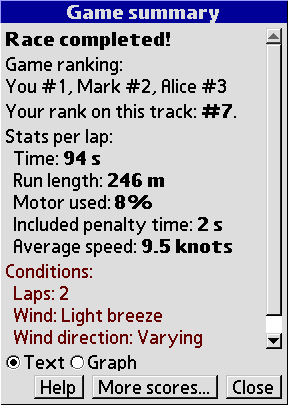 Average wind speed during the race. Light breeze is 4–6 knots, gentle breeze is 7–10 knots, and moderate breeze is 11–16 knots. Number of gates in the track. Distance between two buoys in a gate. For simple order, the route is circular. If the order is mixed, you will have to pass gates in a random sequence, and the route will be more complex. Determines the number of shoals on your way. Shoals will decrease your speed and increase the risk of capsizing. Specifies units used in Top Sailor to display speed: knots (nautical miles per hour), meters per second, kilometers per hour, or statute miles per hour). Specifies units used in Top Sailor to display distances. Specifies the way sounds are produced during the game. Pressing up and down buttons can be used to adjust sail trim or to increase/reduce motor power. This setting affects the size of the on–screen buttons. You need to restart Top Sailor to see changes after this setting has been modified. Select a font used to display overlaid text. If active, an arrow will be shown that points to the next gate. Turn this option off to improve your orientation skills. If active, a static grid of little square marks will be displayed on the water to help you see yacht movements. Shows the apparent wind, i.e. the wind you experience on your (moving) yacht. Select the way shapes are displayed. Displays additional information: yacht speed and thrust, and shows the velocity vector.